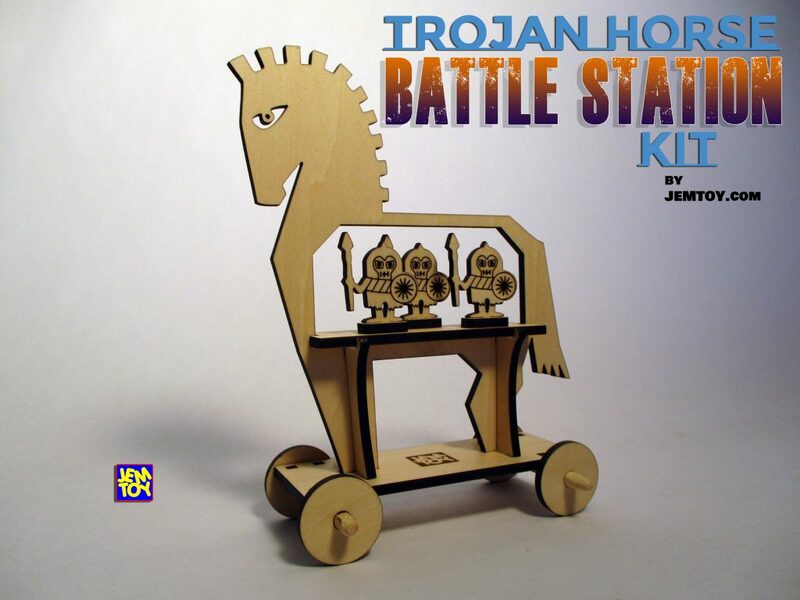 Trojan Horse Battle Station Kit Parts List: 3 Greek Soldiers, 3 Soldier Stands, 1 Top Shelf, 2 Buttresses, 4 Wheels, 4 Axle Spacers, 2 Axle Rods, 1 Bottom Shelf, and 1 Trojan Horse. 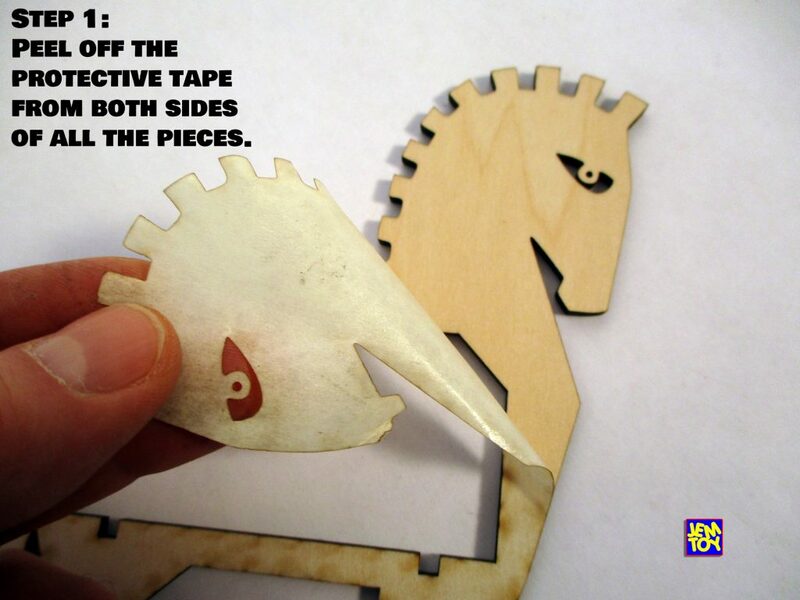 Step 1: Peel away all the protective tape that covers the wood. 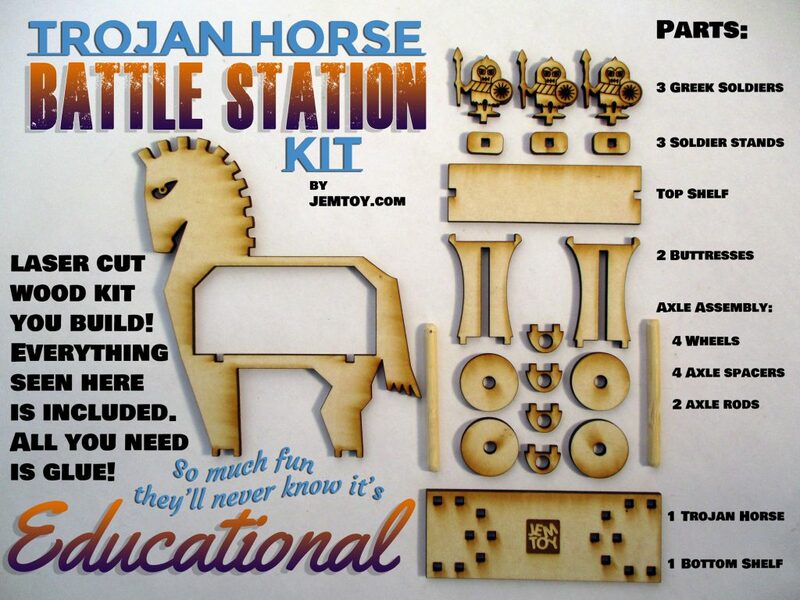 Be sure to peel away all the tape from both sides of each piece before you begin assembling the kit. 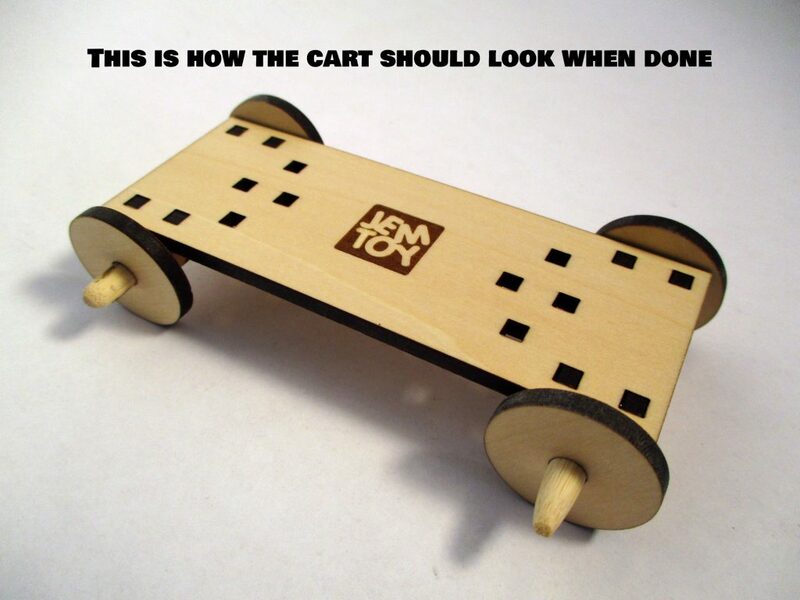 Step 2: Build the cart first. 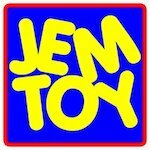 Place the Bottom Shelf so that the JEMTOY logo is flipped over and not seen. 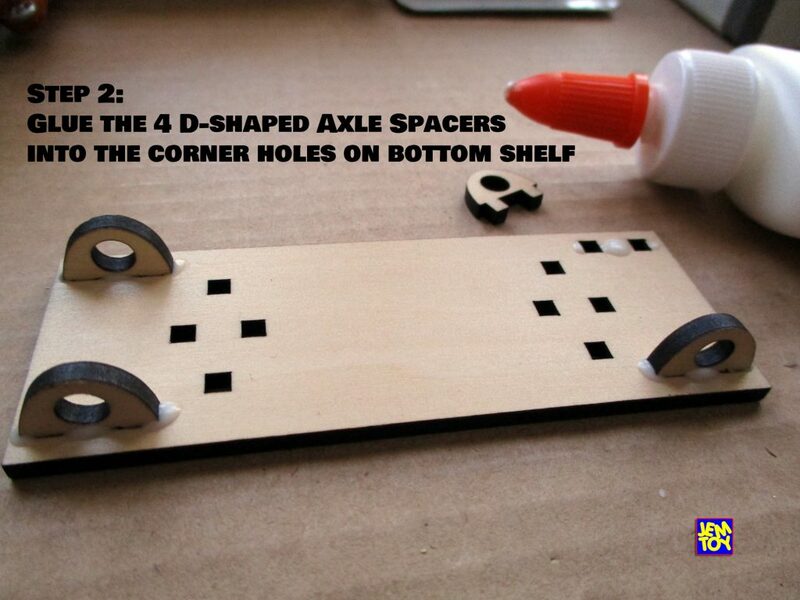 Glue the 4 Axle Spacers (little D-shaped things) into the 4 corner spots on the Bottom Shelf. 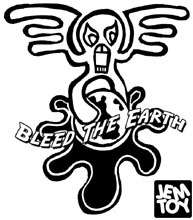 Use a tissue or cotton swab to clean up glue blobs as you go. Step 3: It’s a good idea to let the Axle Spacers dry. 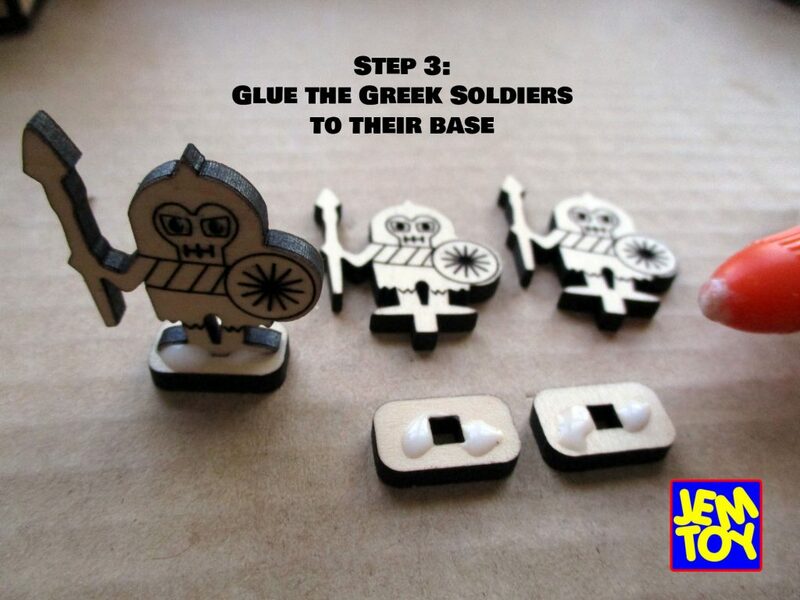 While you wait, glue the 3 Greek Soldiers foot peg into their little rectangular base so they can stand up and fight like an Ancient Greek. 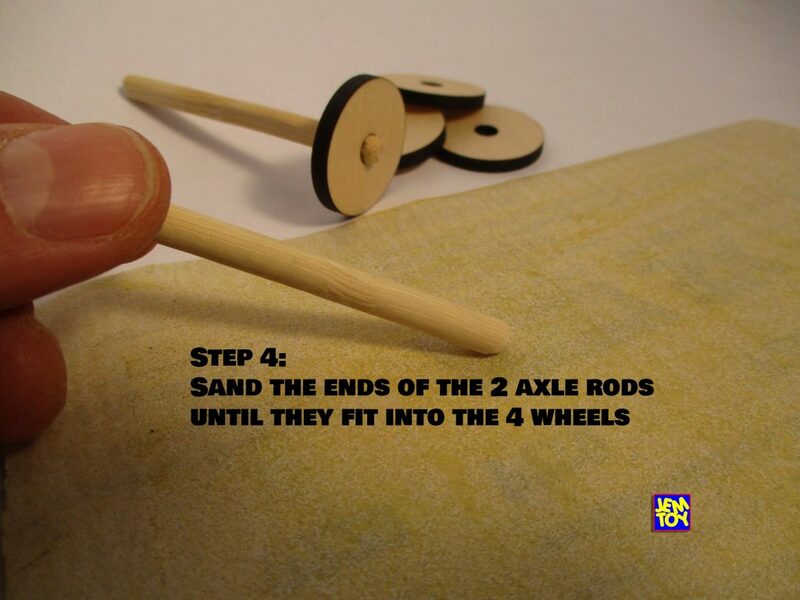 Step 4: A small piece of sandpaper is included so you can easily taper the ends of the Axle Rods for a proper fit into the Wheel. 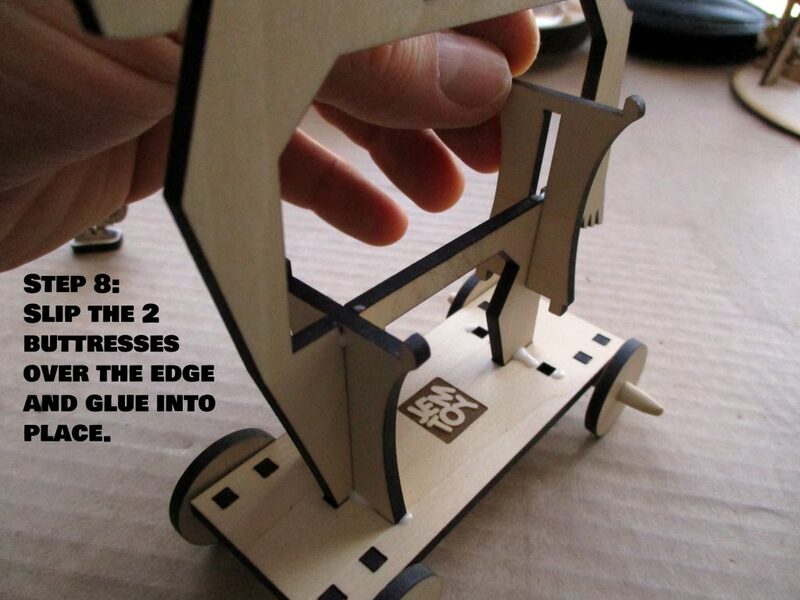 The Wheels don’t need to be glued if they are a tight enough fit. Sand the outer edge of the Axle Rods until they fit tightly into the Wheels. Step 5: When the Axle Spacers are dry you can move on to this step, but not until. Push one Wheel onto each Axle Rod. Slide each Axle Rod through 2 Axle Spacers and push on the last two Wheels. 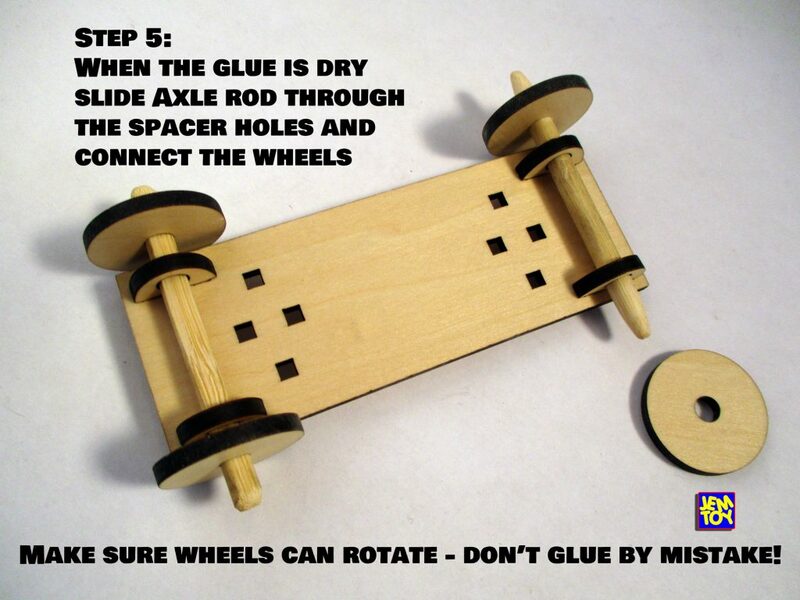 If you decide to glue your Wheels to the Axle Rods, be sure the Wheels can freely turn when you are done. Now the cart is ready to roll! Step 6: Now just a little bit of glue on these 2 spots. 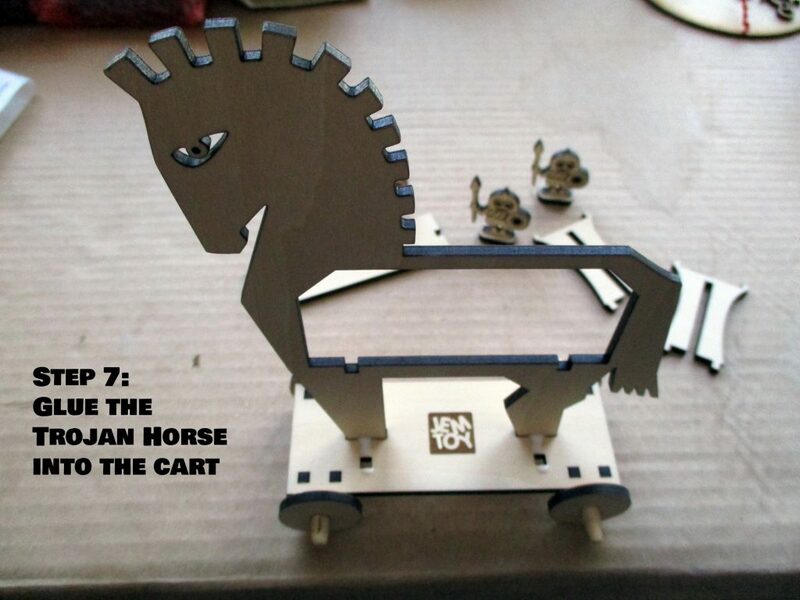 Step 7: Set the Trojan Horse into the 4 peg holes that run down the center of the Top Shelf of the cart. 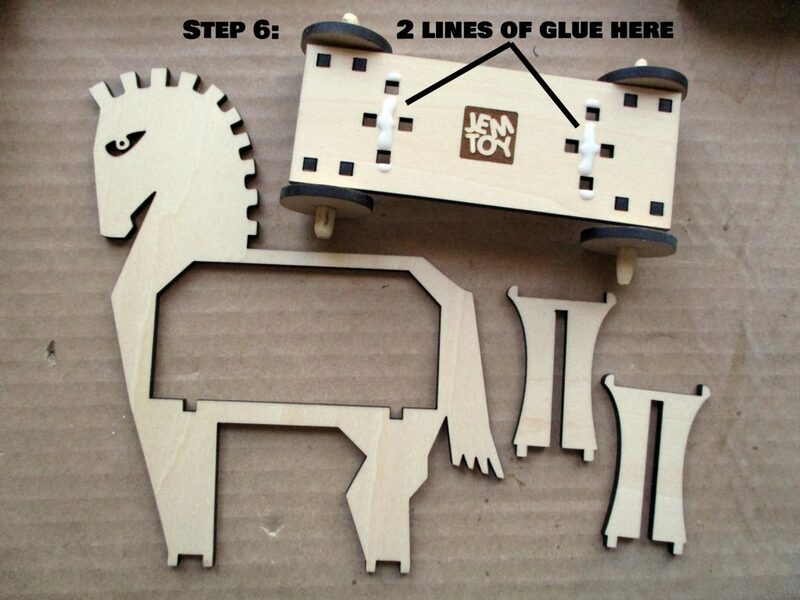 Step 8: Slip the two Buttresses into place, and glue them to the Bottom Shelf of the cart. Step 9: A few drops of glue on the Buttresses so the Top Shelf will stay in place. 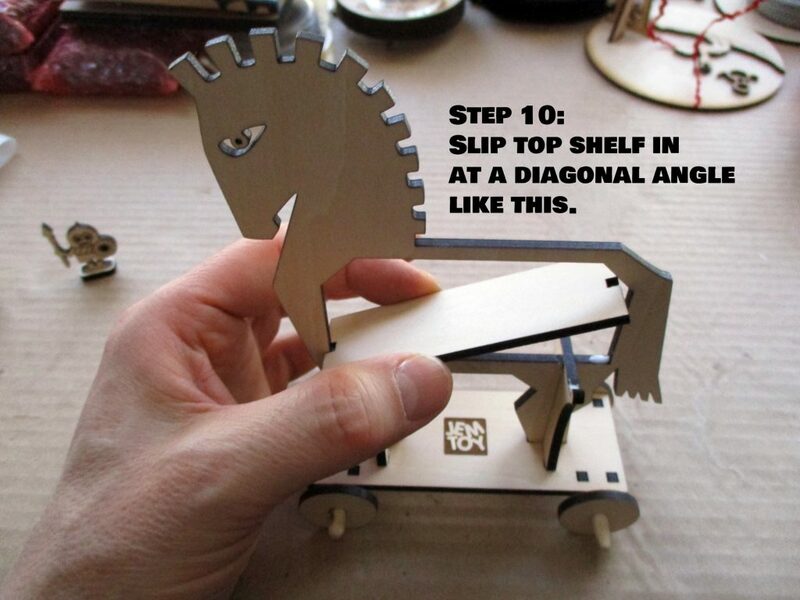 Step 10: You must insert the Top Shelf diagonally and maneuver it down to rest on the Buttresses. 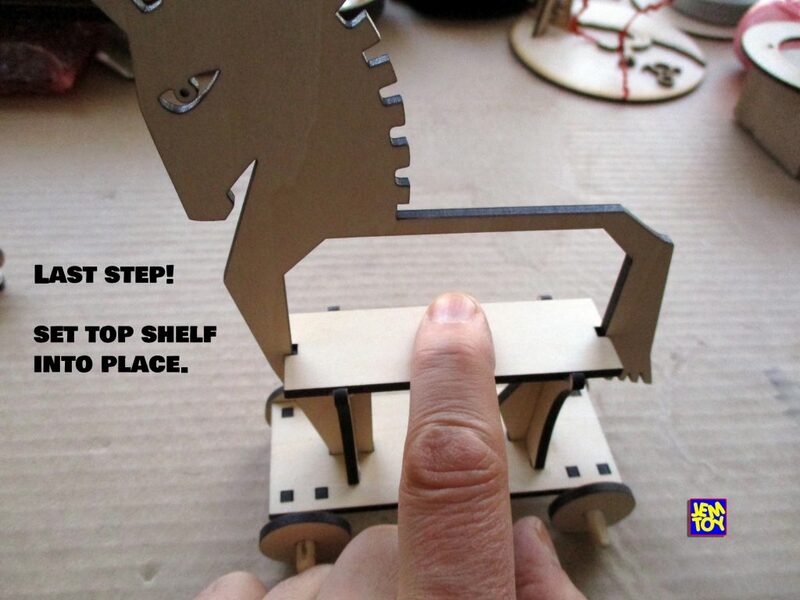 Adjust the Top Shelf so it is centered and press it down. 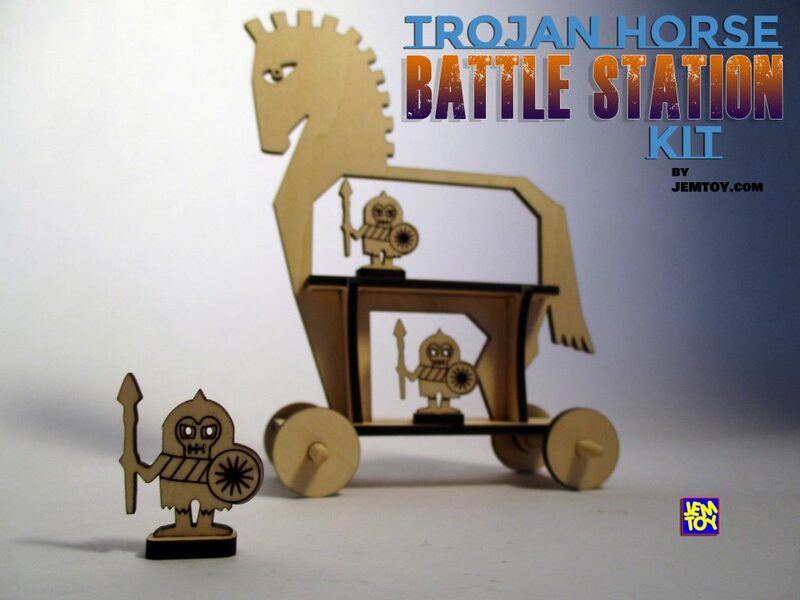 Let the epic battle begin!